Italian rabbi, physician, and philosopher; flourished in Mantua in the latter half of the fifteenth century. He is said to have been born in Naples. The name "Leon" is the usual equivalent of "Judah" and "Messer" (= "Maestro"), the title usually given to physicians. He was rabbi in Mantua, where he had a conflict with his colleague Joseph Colon, in consequence of which both were expelled from the city (1475). Leon wrote a text-book on logic entitled "Miklal Yofi" (see Luzzatto in "Kerem Ḥemed," v. 48), a grammar under the title "Libnat ha-Sappir," commentaries to the "Logic" and the "Ethics" of Aristotle, and a text-book of rhetoric under the title "Nofet Ẓufim." The last-mentioned is the only one of his works which has been printed; it was published in Mantua before 1480 and was reedited by Jellinek in 1863 (Vienna). The object of the work was both apologetic and propagandic. The author desired to demonstrate to the non-Jewish world that the Jews were not devoid of the literary sense, and he wished to prove to his co-religionists that Judaism is not hostile to secular studies, which contribute to a better appreciation of Jewish literature. His theories follow chiefly those of Cicero and Quintilian. The book, as is evident from the fact that it was not reprinted within 400 years, had only a small circle of readers, but within this circle it was highly appreciated. Azariah dei Rossi quotes Leon as a witness to the value of secular studies (ch. 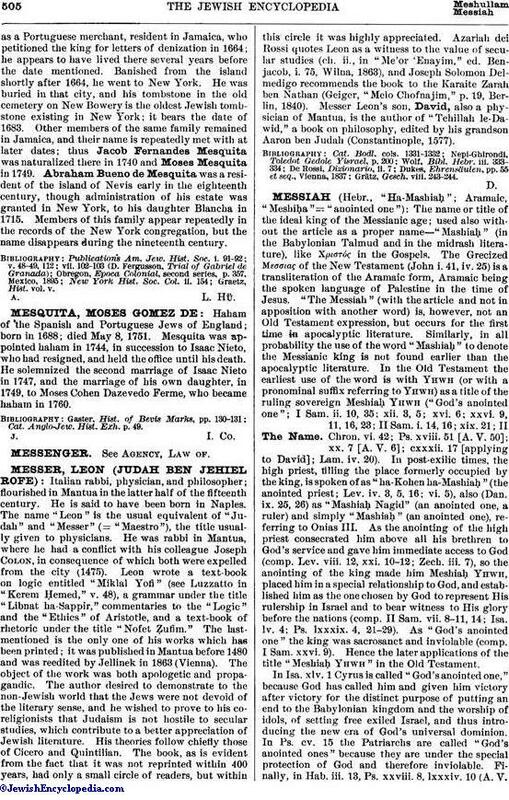 ii., in "Me'or 'Enayim," ed. Benjacob, i. 75, Wilna, 1863), and Joseph Solomon Delmedigo recommends the book to the Karaite Zarah ben Nathan (Geiger, "Melo Chofnajim," p. 19, Berlin, 1840). Messer Leon's son, David, also a physician of Mantua, is the author of "Tehillah le-Dawid," a book on philosophy, edited by his grandson Aaron ben Judah (Constantinople, 1577).